Software Simian or Code Monkey? 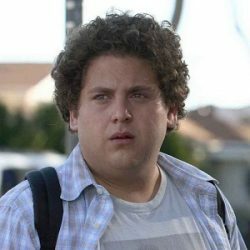 From humble beginnings as a supporting role in various surprise hit comedies, Jonah Hill has expanded his filmography to include some of the best known comedies and dramas of the past decade – affirming his position as a major Hollywood player. Hill is famed for his impressive comedic timing, so to celebrate the release of his latest film on DVD & Blu-ray War Dogs on 26th December; we are taking a look at some of his funniest moments in film. 2007’s Superbad navigates through the final high school year of 3 vastly unpopular guys in the pursuit of girls, keg parties and fake IDs. 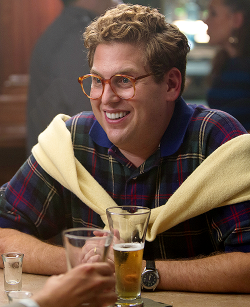 In one final attempt to be cool, Seth (Hill) boasts he can supply a party with alcohol and so begins a series of stupid schemes to buy booze, including the creation of ‘McLovin’ as a fake identity. What is perhaps one of Jonah’s funniest scenes involves buying vodka, and some vivid visions of knocking out an old lady and a security guard going full-ninja. The film is considered to have rocketed Hill’s career, and it’s no surprise with scenes packed with awkwardness, angst and comedy gold. Starring opposite Leonardo DiCaprio is a daunting task, but Jonah Hill took it in his stride as the partner of the increasingly wealthy stock-broker Jordan Belfort. Beginning in 1987, Belfort (DiCaprio) and his neighbour Donnie Azoff (Hill) set up their own brokerage company with crime, corruption and some seriously swanky parties ensuing. Donnie has a love for the finer things in life and quickly indulges in expensive clothes, fast cars and flashy jewellery, yet despite his greed the characteristic goof-ball that Hill plays so well still shines through. Vegan, environmentalist and smart? You’re cool. Buff, athletic and a bully? You’re not. 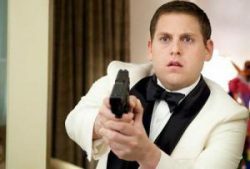 Jonah Hill and Channing Tatum star as undercover cops who go under cover as high school students to expose a deadly drug trade, with Hill’s nerdy character Schmidt quickly falling in with the cool kids at the centre of the scandal. The duo party hard and bring us plenty of laughs, with Hill crashing through windows, beating bullies with vases and somehow succeeding with his quirky attempts to flirt. Two twenty-somethings (Miles Teller and Jonah Hill) living in Miami beach begin raking in the money when they secure an enormous $300 million military deal. Based on a true story, these guys work hard and play even harder – with luxurious mansions, gorgeous women and of course there are the flashy cars – and although their work may be slightly, shall we say dubious? The boys are hilarious throughout, taking selfies with sergeants, speeding across borders and flashing some serious cash to get whatever they want! Own War Dogs on DVD, Blu-ray or 4K Now! Who are films ultimate double acts?